Nirvighnam Kuru Me Deva Sarva-Kaaryeshu Sarvadaa"
"O one with a majestic trunk, a massive form and the radiance of a million suns, I pray to you to remove the obstacles from all my endeavors, always." Lord Ganesha, the elephant God, remover of obstacles between us and our well-being, the God of achievement and enlightenment, wisdom and happiness is my Mother's favorite God. 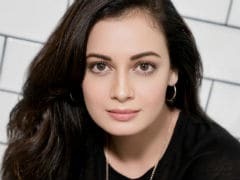 She has collected Ganeshas all her life. Each time I found a fine handcrafted Ganpati I would bring him back home for her to add to her collection. 'He makes me happy' she always says, and so, each time I see Ganesha, I too smile in this knowledge. 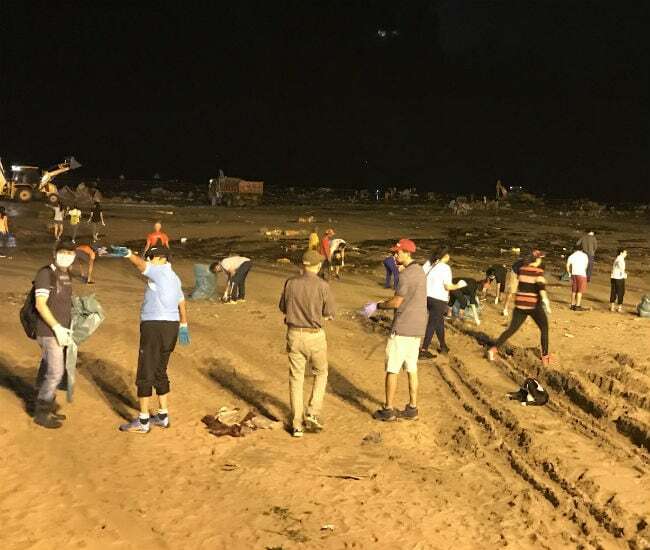 It's 5 am at Juhu Beach the day after Ganesh Utsav and the final day of Visarjan and I am surrounded by hundreds of young people all set to help the BrihanMumbai Municipal Corporation clean the beach. As I stand by the Gandhi statue, I can't help but wonder, so why are we all REALLY here? Mumbai is blessed with one of the most bio-diverse coastlines in the world. The task of preserving Mumbai's fragile coastline bio-diversity shouldn't fall upon conservationists alone; it rests with all 20 million inhabitants of this city. The invasion of plastics in our waters, the unfiltered contaminated toxic waste, the immersions of idols made with chemicals that are poisoning our waters and food chain can no longer be ignored. 1,200 people are here because we want to show the municipality that we are willing to be a part of the solution. 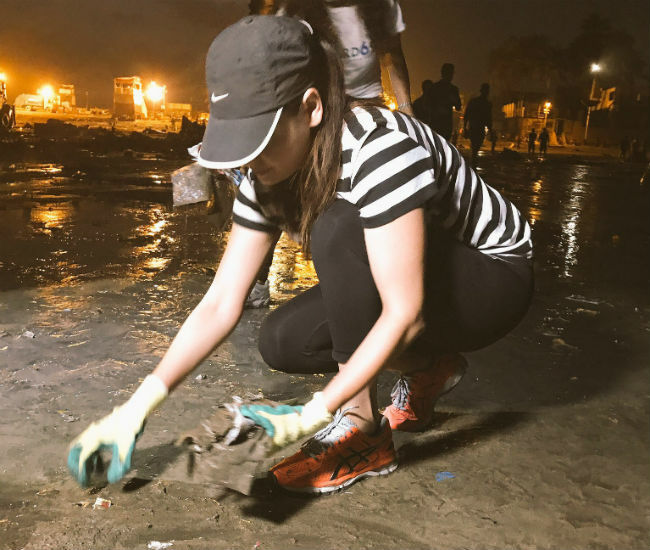 Each of us has discovered in some way or the other that our lack of initiative to ask questions and seek solutions is what was perhaps one of the biggest reasons why our 'Maximum City' Mumbai is turning toxic. Our air, our water bodies, our soil is contaminated with garbage that has not been segregated at source. It is because of our own inaction to improve waste management systems that we find ourselves dealing with the ill effects of waste. For too long we have ignored the fact that what is non-biodegradable by nature eventually has nowhere to go. The journey of our toxic waste is harming not only our environment but also our health. Therefore with an increase in consumption and a lack of effective waste management systems, we must cope with drains that are clogged, dumping grounds that are bursting at their seams, and oceans that are spitting back our filth at us. The solution is not to light a fire, for that leads to toxic air quality, and in turn to a host of medical ailments that no citizen of this country/world deserves. The solution lies only in implementing policy reform that will help contain this beast of a problem and allow our able governments the time they need to play catch up and fix this overwhelming issue of waste. One of these reforms would be to enforce a ban on all Single Use Plastic. It must be done at the cost of the mild inconvenience that citizens, corporations, small and medium businesses etc will all share in equally. Another policy that must be introduced is to make composting and segregation of waste mandatory for all establishments and societies at community locations. This itself will help reduce a sizeable amount of our waste. Our collective willingness to participate in such reform is perhaps best demonstrated by our presence at this beach to commit through action that we will not be just fence sitters or finger pointers. We will become a part of the solution. As we start our clean-up, dismembered remnants of my favorite Lord Ganesha get washed up on the shore. I stop to hold in my hand, the hand of what once was a part of a plaster of Paris idol, painted with lead paint. I look at his hand and I wonder, what would the God of knowledge and new beginnings think of the damage we are causing in his name? What would he say to those who foolishly, ignorantly, or even perhaps knowingly make him of what is not from our earth? What truly shook us up was the discovery that these massive mounds of piled up Ganeshas will ultimately be crushed by the large bulldozers parked on the beach and cleared only to be 'dumped' somewhere else. 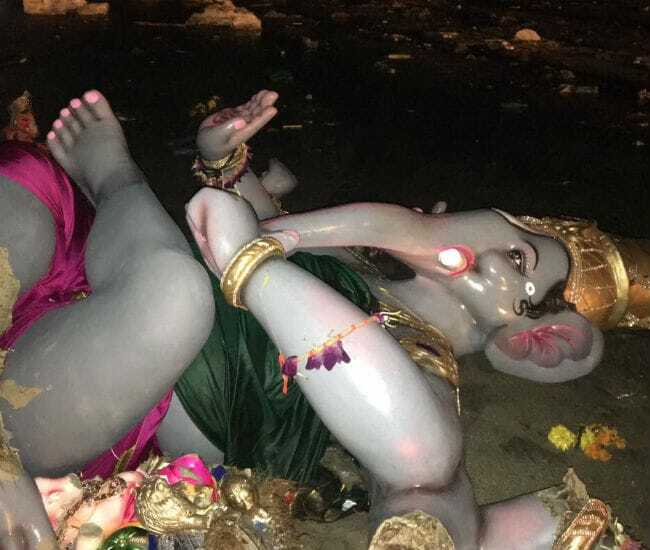 Just the thought that these very Ganeshas that had been worshipped would now end up in a dump somewhere (leaving them on the beach would contaminate the waters because the materials used to make them is toxic) was a stark reality we were confronted with. One that had remained largely unknown up until this moment. 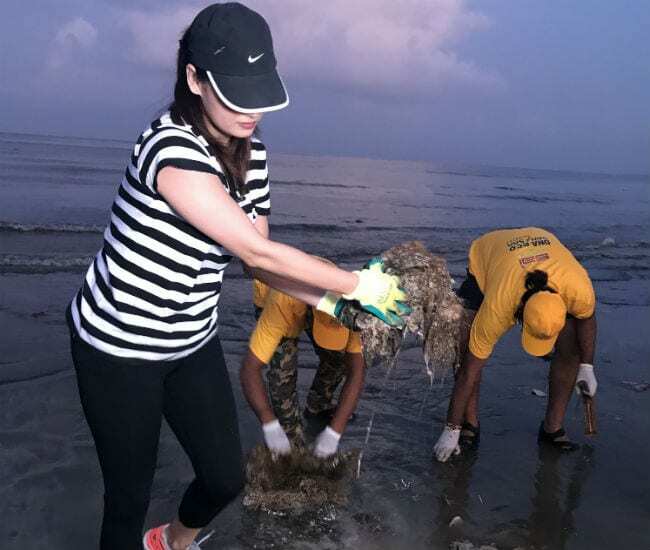 Four hundred tonnes of material were cleared from Juhu beach that day alone. All of it will make its way to a dumping ground. Each of us present at the clean-up is now thinking of how we can encourage all members of our society to only sponsor the use of eco-friendly Ganeshas next year. Each time we bent down and picked up an idol and placed it respectfully in a pile our resolve was strengthened. This must be done. For the sake of the sanctity of our faith, for the love of our Gods, for sake of our health and well being we must find way to change mindsets. We will achieve this. We have His blessings.